The concept of supply & demand is a simple one. The best time to sell something is when the supply of that item is low & the demand for that item is high! Anything under a 6-month supply is a seller’s market! 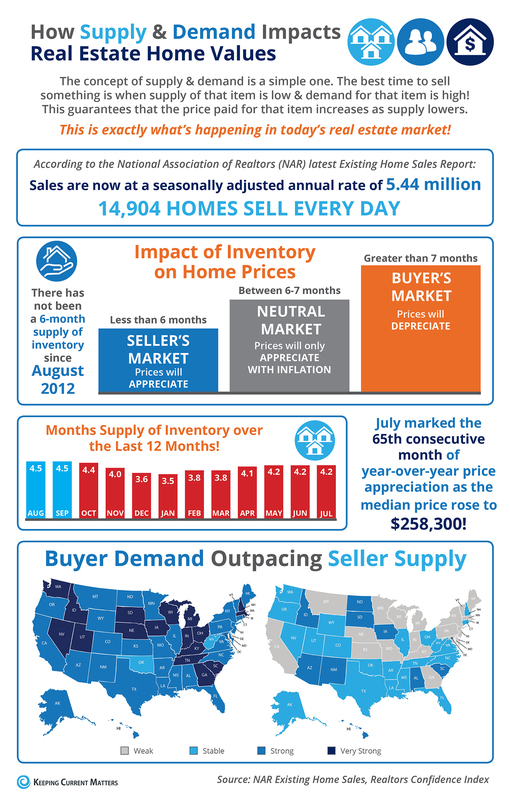 Nationally, there has not been a 6-months inventory supply since August 2012! Inventory levels differ depending on the area of the country and price range, so be sure to consult your local real estate professional for your exact market conditions. This entry was posted in Buyer Info, Home Ownership, Local Info, Market Trends, Seller Info and tagged Hampton Roads, homes, RE/MAX, Real Estate, real estate listing, realtor, sell, Virginia Beach by remaxalliancevb. Bookmark the permalink.